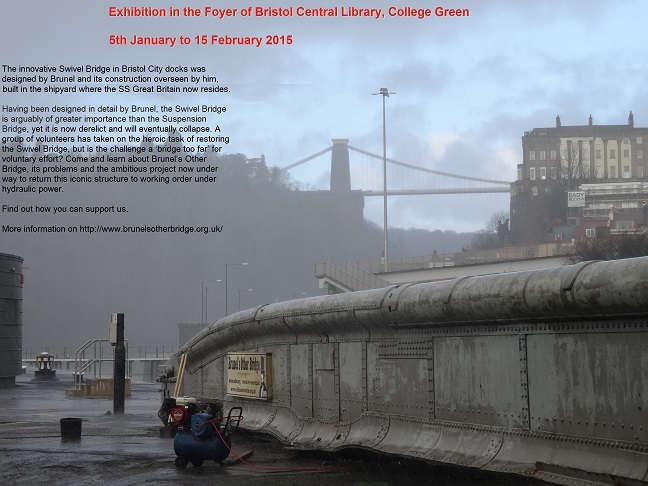 PLEASE HELP US SAVE BRUNEL’s OTHER BRIDGE. WE HAVE GIVEN UP OUR TIME WILLINGLY TO SAVE THIS FORGOTTEN GRADE II* LISTED BRIDGE. PLEASE HELP US BY PROVIDING DONATIONS LARGE OR SMALL. JUST PRESS THE BUTTON. EVERY LITTLE HELPS. AND PLEASE SPREAD THE WORD AROUND TOO. The main donation link is: https://mydonate.bt.com/charities/brunelsswivelbridge. AIBT, the lead charity for BOB was featured on the front cover of this years Register for their work on Brandy Bottom. Alf died peacefully on Wednesday evening, 2nd November 2016 after a cardiac arrest on Friday. He did not regain consciousness and suffered no distress. The family were all with him. 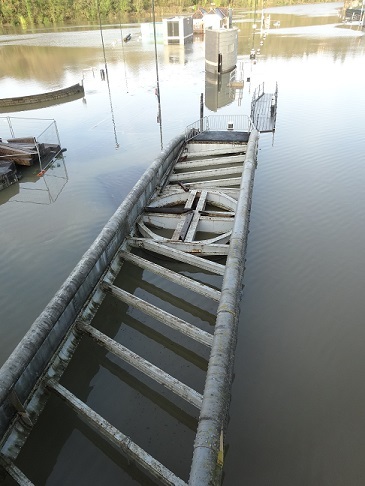 Alf left an enormous legacy of achievements in the historic harbour and wider afield. However he had not finished this work; and with his usual farsighted vision, he was still working towards improving and enhancing harbour facilities. He was involved with the restoration of the Brunel Swivel Bridge (known as BOB, Brunel's other bridge), which lies disused under the Plimsoll Bridge. It has proved a difficult project, and a major scheme failed about 8 years ago. So a small group of us has been working to develop a new project, and Alf has been a key player in this. However it was his experience of recent regeneration and conservation projects that was also invaluable to us. He was a true expert, and shared his wisdom and expertise with modesty and a light touch. Alf gave valuable advice on how to develop a scheme that would be attractive to the Heritage Lottery Fund, and helped fill in the necessary forms. He and I had just finalised an initial application form to the Heritage Lottery Fund, and when I got their positive response last week, my first thought was to phone Alf to tell him. He brought valuable experience of fund-raising and provided the names of useful contacts in many local organizations. He was a skilled 'politician' and was using his experience and networks to engage representatives of the city council in the bridge project. We will feel his absence terribly. Michael Bussell wrote "I'd known him for quite a while, firstly when we both worked at Ove Arup & Partners, and later after he had set up his own consultancy. We shared a practical interest in 19th century engineering: we were in the Arup team that bid for (and did some) work on the SS Great Britain and its dock a while back, while more recently I was a sounding board for his thoughts on the scheme to repair / restore the splendid Victoria Bridge in Bath, and the Bristol Underfall Yard development plan. He also served of course as a Trustee of the Clifton Suspension Bridge - the third trustee I have known, after my Bristol Civil Engineering 'pedagogues' Professor Pugsley and Stuart Cullimore. And I believe he was involved with the Swivel Bridge. "I heard the news via Arups. I shall miss his creative thinking and our lively discussions. He was not a member of BIAS, but he contributed much to the understanding and conservation of engineering landmarks in the Bristol region. 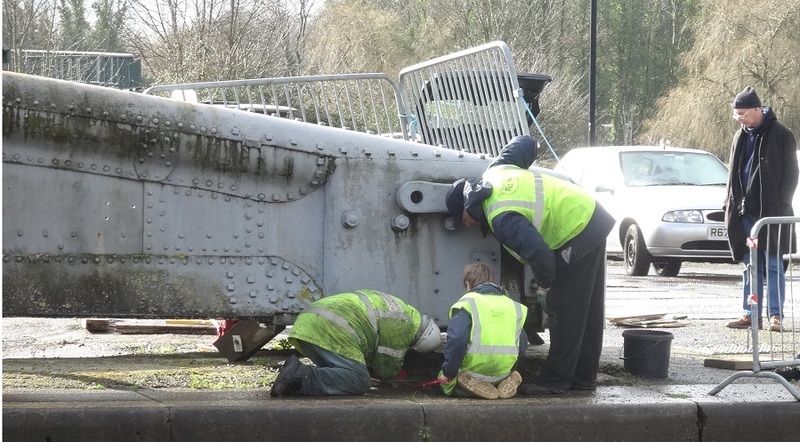 130 visitors came to see conservation work taking place on Brunel’s wrought iron opening bridge and view the test plates that were hot riveted on site. Unfortunately the location was wrongly given on the leaflet so many people told us they had great difficulty in finding it. 25 booked for a guided walk from ss Great Britain at 2pm. We received many positive comments about our work. Donations very encouraging, as was the feedback from visitors. 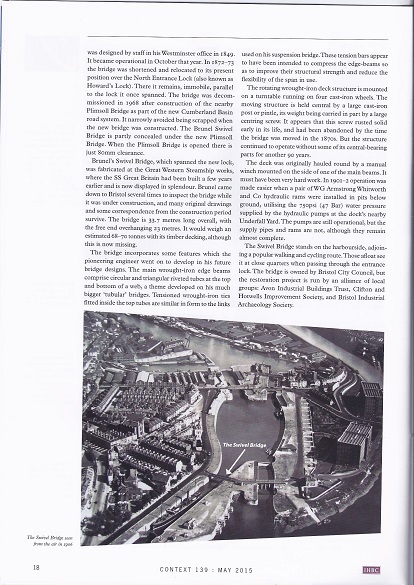 23 feb: Bristol Post BOB Mentioned in article about Bristol's Bridges and refers to our website. "Lies disused on Cumberland Basin. It was designed in 1849 by Brunel to carry traffic over the new South Entrance Lock ('Brunel's Lock') in the Cumberland Basin. 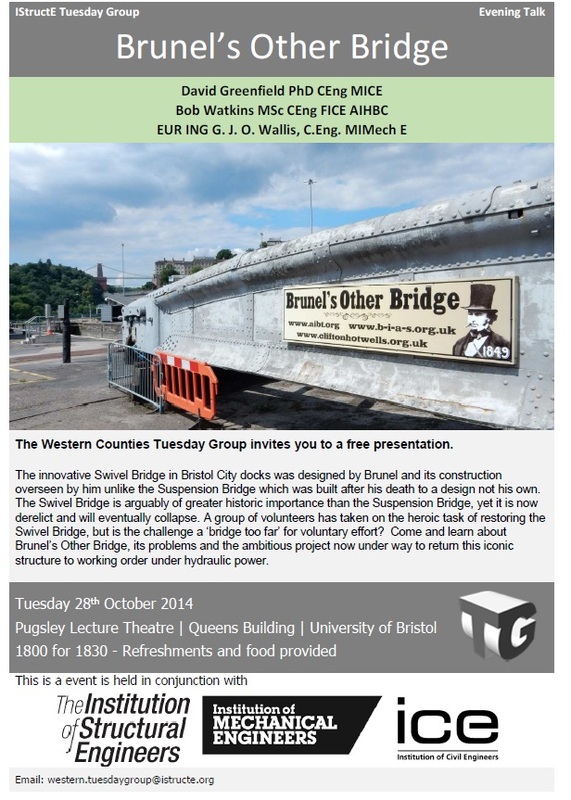 Brunel himself was closely involved in its design and construction. 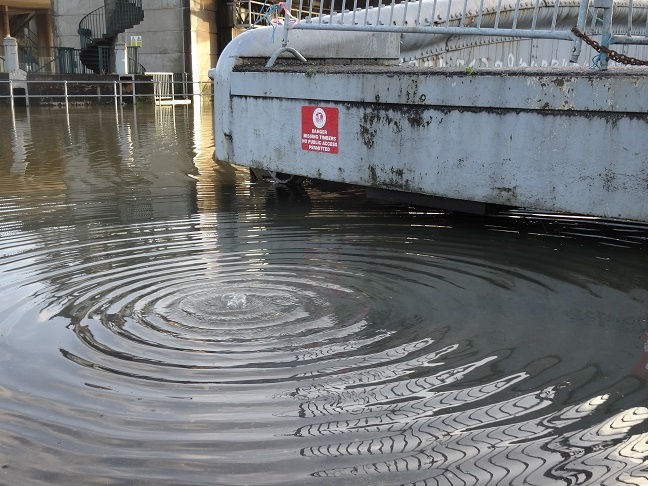 It was decommissioned in 1968 after the construction of the Plimsoll Bridge, and volunteers are now working to preserve it." 12 September: A good stream of visitors all day and the total head count was 222 (compared to 158 in 2014) and many signed support sheets. 8 September: Doors open day on 12 september. 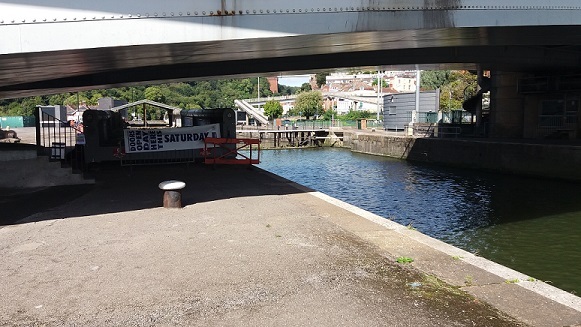 Guided walk from SS Great Britain was oversubscribed, but the volunteers are there all day from 10-4. Bristol Post gave us a plug. 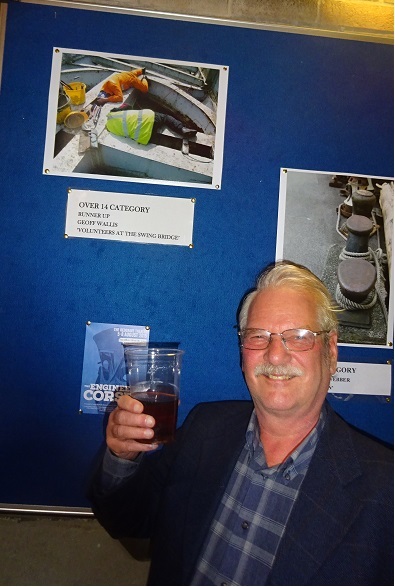 5 August: Maggie Shapland and Geoff Wallis were winner and runner up in a Brunel photographic competition in the over 14 class (other classes were under 14 and hobbyist). 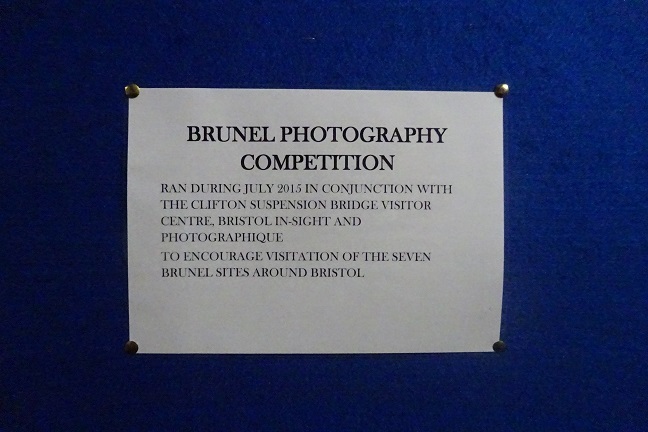 The competition was to celebrate the life of Brunel by photographing one of Brunel’s seven sites in Bristol. 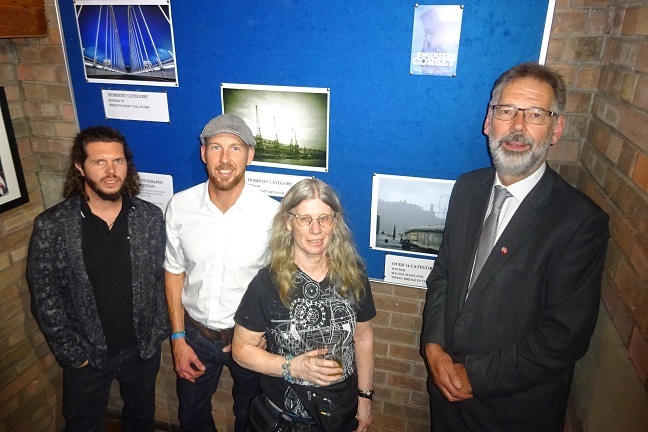 The winning images were displayed at Redgrave Theatre during all showings of ‘The Engineer’s Corset’ and on the Clifton Suspension Bridge website. This was in association with the Clifton Suspension Bridge Visitor Centre to mark the 150th Anniversary of the Clifton Suspension Bridge. The Engineer’s Corset is a new play about one of Bristol’s most famous engineers - Isambard Kingdom Brunel! It plays at the Redgrave Theatre from Wednesday 5th – Saturday 8th August. The Engineer’s Corset is based on a true life event in the Brunel household. When Isambard swallows a coin, after playing a familiar game with his children, his wife Mary waits anxiously as her husband’s life hangs in the balance. Victorian England is revisited while Brunel, on his death-bed, designs a swinging frame to help release the obstinate coin. It is a true story; one that will remind you of Brunel’s genius while also revealing some little known local history. With a cast made up entirely from the local community this is a play for Bristol about Bristol to celebrate Bristol's heritage. Presented by Louise Matthews Productions Ltd, Janet Goddard and Chantry Dance Company. 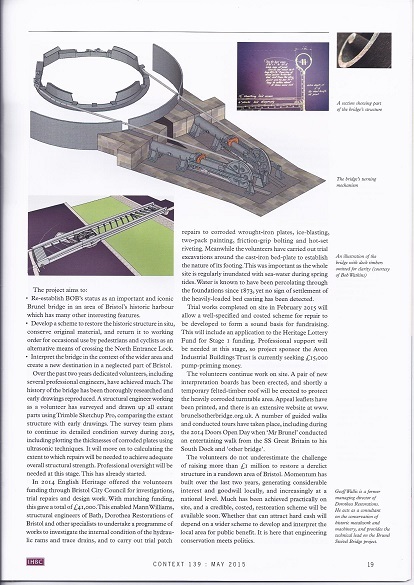 May 2015: The Institute of Historic Building Conservation published an article by Geoff Wallis about progress and challenges of the project. 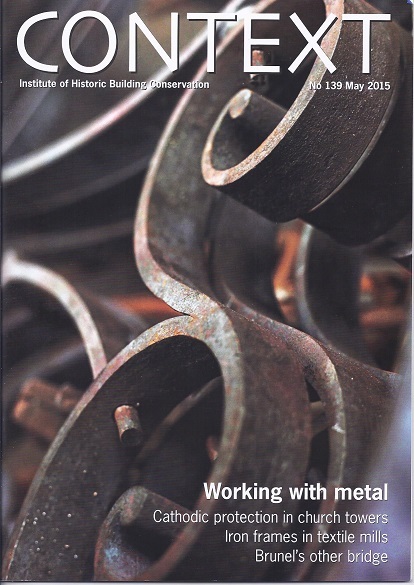 The journal featured Working with Metal projects. 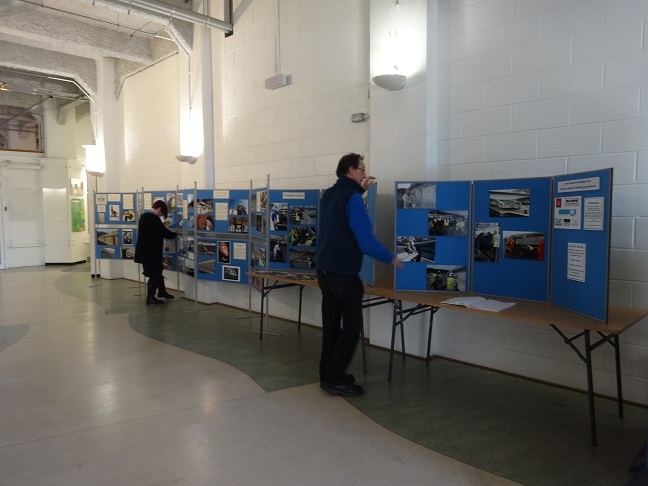 Senior Create officer Michelle Scoplin and Create officer Phil Tomlinson checking the display. It may well be able to stay after April. Recollections of George Waite I Eng. 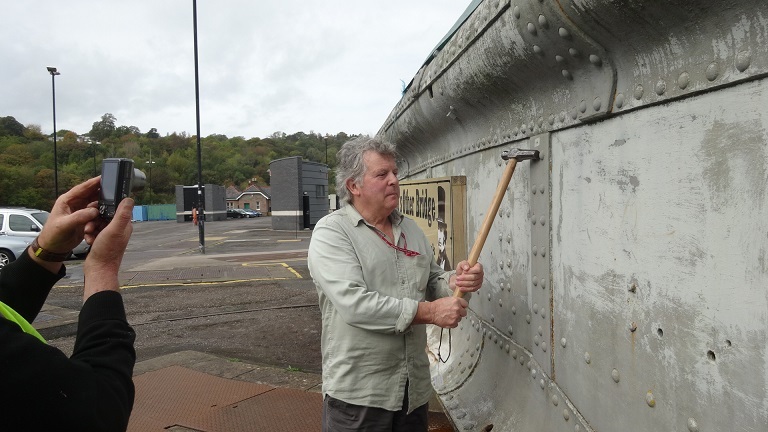 On the 18th of October 2014 at a Brunel's Swing Bridge work day, we were privileged to hear George Waite talk about his memories of rivetting, and boiler making, and point out features of the Bridge rivetting. 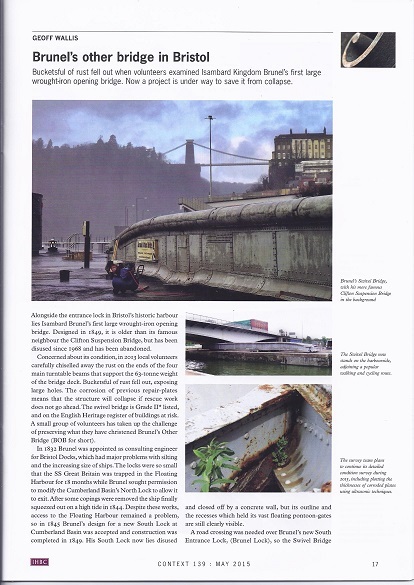 13 October 2014: Rachael Clarke, a video journalist for Made in Bristol TV - the new channel that launched this month wanted to cover our campaign to raise money and ask for help for Brunel's Other Bridge. It is a great opportunity to share the campaign on local television. She interviewed Mary Stacey as our representative to tell the people of Bristol about it. It was shown at 6pm and 9pm and will also be shown at the weekend at 6pm. They have noted down to do a follow up on our campaign as they think it will be great to see the progress. If we have any extra information or anything that will be happening with the future of the bridge we have agreed to get in touch. Rachel will repackage it the interview when she gets a chance so we can put it on our website. 10 October 2014: Mary Stacey was interviewed on Radio Bristol by Nigel Dando just before 8am this morning. 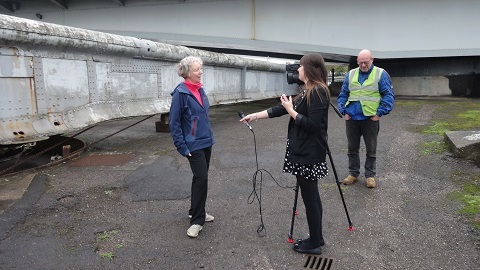 Mary said how important the bridge is, how we want it to be valued as an integral part of the Brunel legacy in Bristol, how neglected it has been, thanks to EH for the current funding, support from BCC, wonderful volunteers, we need £1m!!! It was broadcast from the Bridge itself, competing with road noise but it was clear and concise. The website showed an immediate increase in hits. Lets hope the benefactor(s) come forward. Participating in Bristol Doors Open Day on Saturday 13 September 10-4 for the first time for many years. Bristol Doors Open Day is a once-a-year chance to look behind closed doors and discover the city’s hidden treasures. You can explore fascinating buildings, join guided tours and enjoy a range of events and activities – all free for the day. With over 60 venues taking part this year – the event’s 21st birthday – join us for a fantastic celebration of Bristol’s history, architecture and culture. 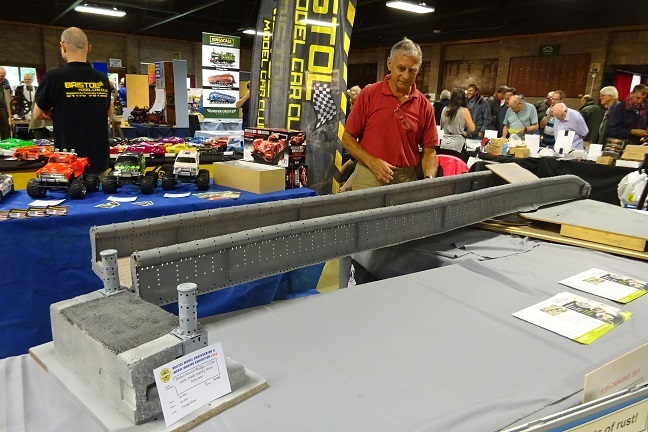 18 August 2014: Bob Watkins who is a Fellow of the Institution of Civil Engineers has produced some wonderful plans and elevations which aid our understanding. These are now on this website. Proposal	Application for a Certificate of Proposed Development (Listed Building) - proposed works to give greater protection to the structure and prepare for future works to restore the bridge. BIAS talk at Keynsham British Legion, Charlton Road, Keynsham BS31 2JA. 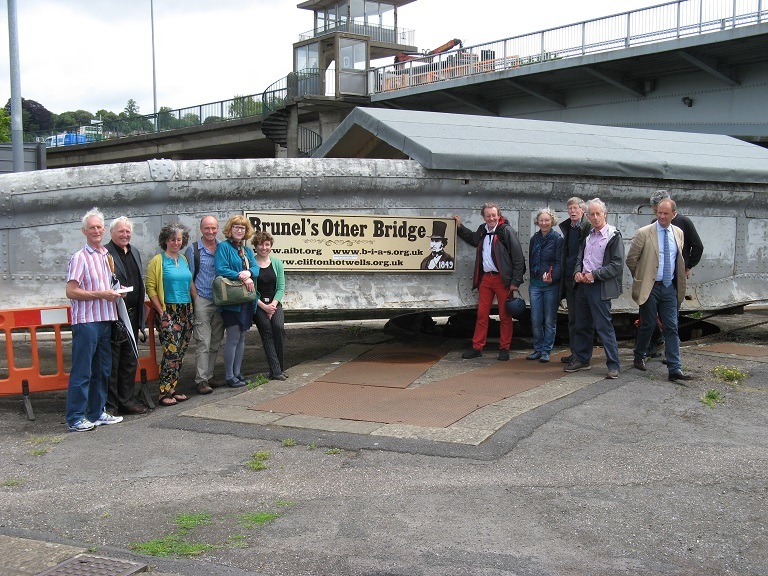 David Greenfield talked about the new research into the history and heritage, and Geoff Wallis about recent aspects and refurbishment of the Brunel Swivel Bridge.